I have always been an animal lover. Growing up, our household was alive with diverse pets. We had fish, hamsters, cats, dogs and birds. Although I cherished them all, the birds captivated me the most. I was in awe of these beautiful creatures and their unique personalities. I knew someday when I was a “grown-up” I would have my own parrot. In 2008, I was a working professional in a diverse and wonderful city. I had my own place for the first time. Although it was a modest studio apartment, I was proud of it. My home was the embodiment of my accomplishments as an adult. But something was missing. My companion animal, my parrot I had always longed for. Thus I began my quest. I pulled out my parrot book, determined to find that elusive bird that caught my interest years earlier. They are called Lesser Jardines parrots, and it turned out they were not easy to find. 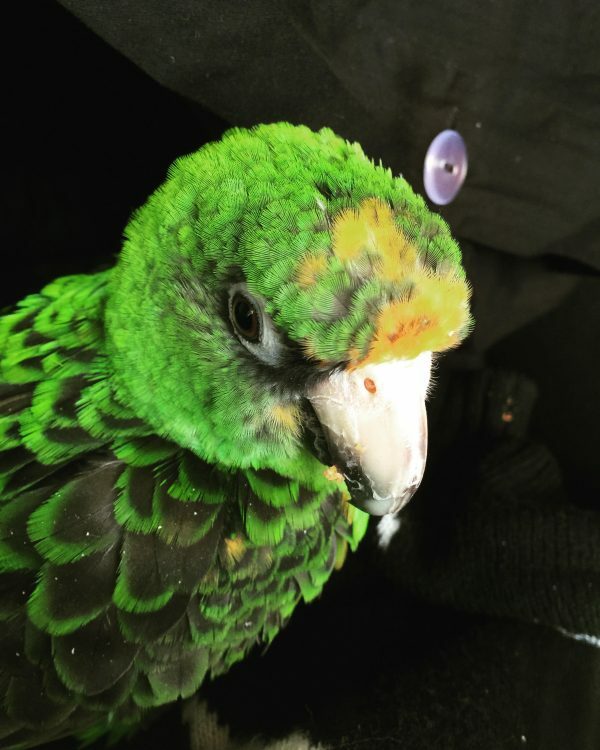 After months of searching, I found an animal rescue farm that happened to have a flock of Lesser Jardines parrots. I bought a cage, filled it with toys, and made the two-hour drive to find my new friend. When I arrived, I found myself in an outdoor aviary surrounded by Jardines parrots. Some were trying to fly to me, pulling at my shoelaces, making lots of noise. As I scanned the space, I saw a shy little guy in the corner, peeping at me from over his shoulder. He had a malformed toe but I didn’t care. This was my baby. I took him home and named him Ziggy. Since 2008, Ziggy has been my constant companion. We have moved all over the place together. I experience happiness, joy, love, fear, pain, sadness and heartache that life brings with my parrot by my side. We sing and laugh together, and he comforts me when I am in distress. For many years I existed without him in my life, but it’s so hard to picture that now. I never knew a bond like this could exist between a person and a parrot. My name is Tanya, and I love all things creative. I am a vintage enthusiast, music lover, soap maker and visual artist. I also suffer from chronic illness. Celiac Disease, Fibromyalgia and Dysautonomia have changed my journey forever. With that said, I enjoy the shared experience of life. We all have a story to tell, and we all have something to learn from one another.